Calendars are color-coded for weekly, monthly, quarterly, seasonal and annual tasks. Each page also features a list of daily maintenance tasks. Some pages include special callout reminders and tips for things like vacant-unit inspection and door cleaning. The customizable Word templates allow you to alter the calendars to your maintenance schedule and needs. New articles addressing curb appeal and door maintenance have been added to the annual Maintenance Guide for 2019. PLEASE NOTE: Though there is some new material, the 2019 booklet contains many of the same articles that were included in the 2018 guide. 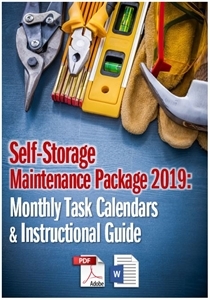 The maintenance-calendar package contents will be delivered to your “My On-Demand Library” in a downloadable zip file folder.